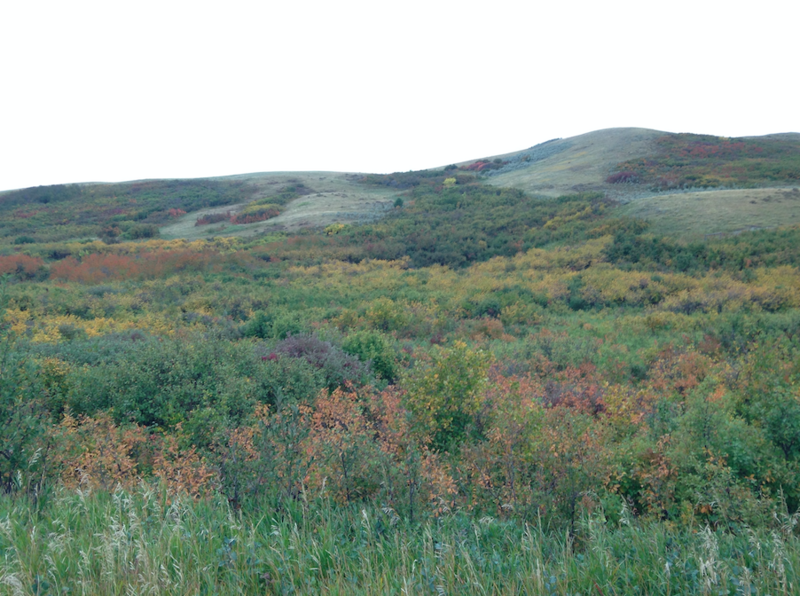 On a warm September day, I looked down into a coulee from where my horse and I stood on a breezy prairie hill. Eight heifers crashed through the coulee, making a trail through the brush one after another. This was a tricky pasture to navigate since the hills are steep and rocky and also dense, filled with thick bush and trees. But it was a favorite pasture for the young yearling cattle and for me as well because of the beautiful scenery and bountiful berry bushes. My dad dropped Dee (my buckskin quarter horse) and I off with the truck and horse trailer in the pasture while he worked on the fence. Dee and I were on a mission to find all the yearlings to make sure none had escaped again to a neighboring pasture. My great-grandmother’s family had ranched the hills I rode that day; between 1876 and 1881, Chief Sitting Bull stayed there occasionally and possibly hundreds of Lakota tipis filled the valley. The valley is only a couple miles from the Wood Mountain North West Mounted Police Post and not far from where Jean-Louis Légaré’s trading post stood at one time, which served Métis, Lakota, and settlers. I pondered the landscape, the history, my current mission, and how much better the world seemed from Dee’s back. 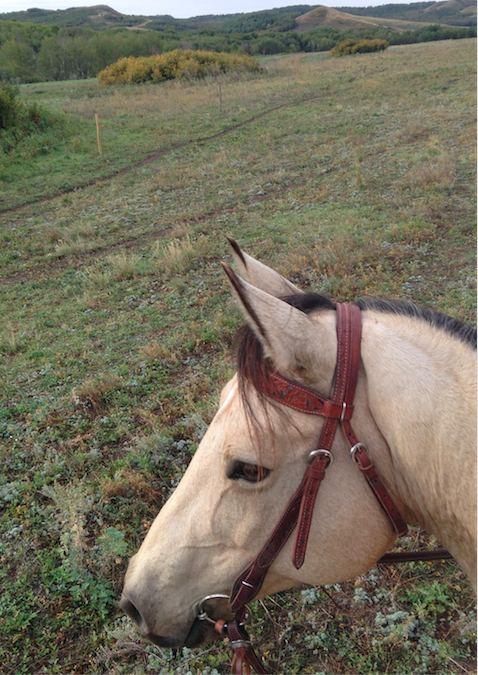 I thought about how the land and that place, the history, my family, and even my horse came together to represent me. Land and identity are interconnected for all Indigenous people, but what I aim to show – and what is rarely acknowledged – is that the politics around these entities are an every day reality that affects everything we, as Indigenous people, do. Vibrant fall colors of the Wood Mountain hills. Photo Credit: Claire Thomson. My research focuses on my own community’s history in the Wood Mountain area of southern Saskatchewan in Treaty Four territory, although the Lakota are not part of any Canadian treaty. My Lakota family fled to Canada from the United States following the 1876 Battle of the Little Bighorn. The Lakota are often ignored in Canadian national narratives and are typically categorized as “American Indians,” thereby disregarding our sovereignty and connections to land outside of constructed national borders. Dakota scholar Vine Deloria Jr. maintained that the most significant difference between Indigenous and Western ideologies is the importance of land to Indigenous systems of being and relations. Deloria argued, “American Indians hold their lands–places–as having the highest possible meaning, and all their statements are made with this reference point in mind.” In contrast, Western societies tend to use historical/developmental terms to find meaning, thereby placing time as the narrative of central importance. For Indigenous people, land and place give meaning to all relationships and ways of being. Academics often call for the separation of personal existence from their work in order to uphold “objectivity,” but for Indigenous scholars this is impossible. As an Indigenous academic, colonial politics encompass my life, particularly as it concerns identity and land and they cannot be separated from my work. Too many settler Canadians fail to understand the historical processes of erasure and dispossession let alone the same ongoing processes that continue to be invisible but that we all have a stake in. They also fail to see how Indigenous people cannot simply “set aside politics.” Processes of dispossession and erasure of land and identity materialize in Indigenous people’s lives on a daily basis. Like all people, my ancestry is “mixed” and my family tree is blooming with white ancestors. Unremarkably, this has led some to question my Indigenous identity or “authenticity.” This is transparently an issue for the Canadian nation-state, but both non-Indigenous and even Indigenous friends and family have also attempted to calculate my “blood quantum” in their attempt to rationalize what they perceive as evidence of “not really being Indian” and my middle-class, farming/ranching, off-reserve upbringing likely contributes to their deductions about “seamless” racial categories. Unfortunately, Indigenous people have internalized colonial identities that break down community membership based on the interconnectedness of kinship and land. The binaries of modern/traditional, Indigenous/newcomer, and authentic/inauthentic continue to be broadly and systematically applied to all North American Indigenous people. These dichotomies regularly transpire in my own life as a non-Status Indian, Lakota woman who studies within a Western, urban institution while striving to obtain an education that will be useful to my community. My connections to place and community are deeply rooted in Lakota understandings, which keep me grounded when struggling with the neo-colonial politics of identity. I refuse to allow draconian policies, such as the Indian Act, to affirm my identity. Connections through kinship and to place are a continuation of much more holistic and persistent Lakota worldviews. A centering in place-based understandings around the flexibility and fluidity of past Indigenous communities and identities challenges the categories Indigenous people are placed into and allow us to utilize all the tools available, whether they are constructed as “traditional” or “modern,” to foster systemic and lasting change. The implications of how we grapple with these issues (contemporary or historical) – the environment, sovereign nation-to-nation relationships, and the Indian Act – are contested and immensely important. Indigenous relationships between kinship, community, place, and land hold promising keys to Indigenous action for decolonization and self-determination, although what transpires will be different for varying Indigenous communities. Dee asking, ‘Are we done climbing hills and pushing bush for cattle yet?’ Photo Credit: Claire Thomson. My musings about my connections to place and identity have raised some questions about the current discourses with the new Liberal federal government, particularly around the often quoted “nation-to-nation relationships” phrase, the term “recognition,” and the contentious statement that “we are all treaty people.” Stressing nation-to-nation relationships between Indigenous peoples and the Canadian state is important for helping settler Canadians to understand Indigenous topics in a context more broadly than simply based on ethnicity or race, but to see Indigenous sovereignty as intact and valid. But how is public discourse to understand Indigenous people who are non-Status or did not sign Treaty and thus technically not part of these so-called “nation-to-nation relationships”? Are Indigenous people themselves also buying into binaries of settler/Indigenous, Status/non-Status, treaty/non-treaty, authentic/inauthentic that may be furthering dividing Indigenous people and action? Are settler Canadians and their governments committed to the meaningful systemic change, not merely projects of recognition and cultural diversity? Historical and ongoing dispossession of Indigenous people is tied directly to the removal of cultural and physical links to place and land. Current impositions of unsustainable resource development continue to disregard Indigenous expressions of sovereignty. Indigenous understandings of place/land inform current decolonization and self-determination efforts by challenging colonial borders and constructions that view Indigenous people and places as static. Discussions of Indigenous nationhood need to include the dynamic relationship of Indigenous peoples to land and place. Prime Minister Justin Trudeau’s calls for nation-to-nation relationships with Indigenous people in Canada need to be based upon ethical environmental relationships as well. The Indigenous representation at the COP-21 United Nations conference on climate change in Paris recently argued that Indigenous rights need to be part of environmental agreements and action. This is an excellent example of Indigenous people using all the tools available to resist harm to their rights, sovereignties, and lands. In 2012, Stephen Harper’s former Conservative government also faced similar Indigenous resistance after the Navigable Waters Protection Act (now the Navigation Protection Act) was passed that removed environmental protections of water without the constitutionally required consultation of Indigenous peoples. Connections to land, place, community, and kinship are enduring and they will continue to shape ongoing nation-to-nation relationships because they cannot be separated from Indigenous peoples’ worldviews, being, and sovereignty. Claire Thomson is from the Wood Mountain area in southern Saskatchewan and is currently a PhD student at the University of Alberta in the Department of History and Classics. Vine Deloria, Jr. God is Red: A Native View of Religion (Golden, Colorado: Fulcrum Publishing, 2003), 61.
good article but a quick read showed 2 typos: it should be “affects” not “effects” in the 2nd paragraph and further down it should read “than simply” not “that simply”.